The Seawave is my current IK. It replaced a Grabner Amigo an Incept K40 and a Java before that. 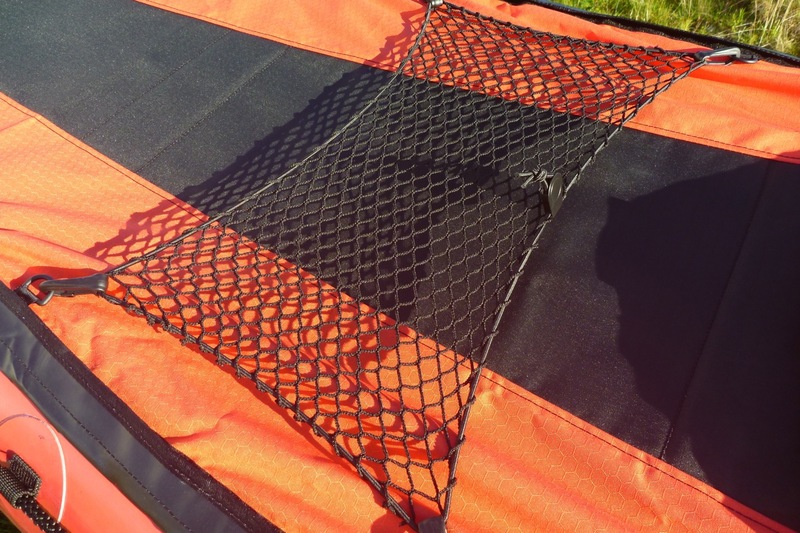 And before those boats for years I ran a Gumotex Sunny. A run out to Bottle Island in the Amigo in 2014 was harder than it should have been, considering the flat-calm conditions. And perhaps because I do more sea than river these days, I think I flipped too far from the the speedy Incept to the solid Amigo. 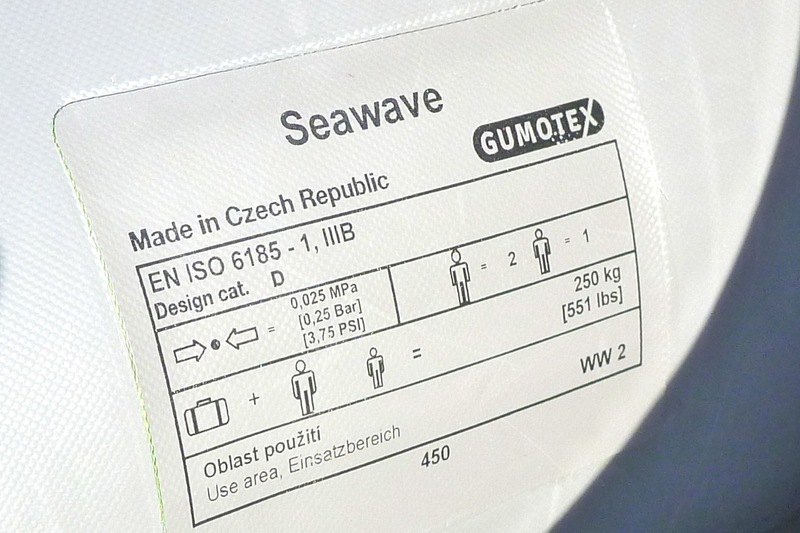 But since I bought the Amigo, Gumotex’s Seawave came on the scene. It’s fast like the Incept but better all round. 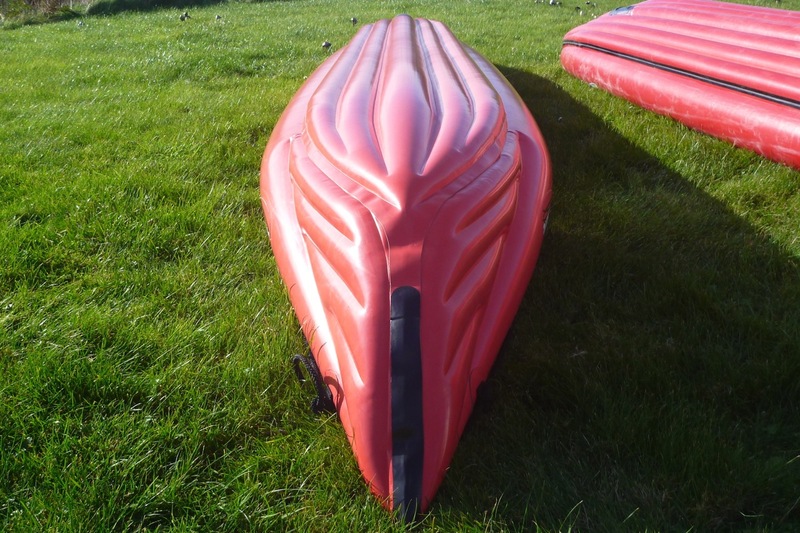 What finally clinched it was a great price from boatpark in Prague of around £570 with free EU delivery (Boatpark’s prices where always miles better, but this loophole has now been closed or made more complicated). 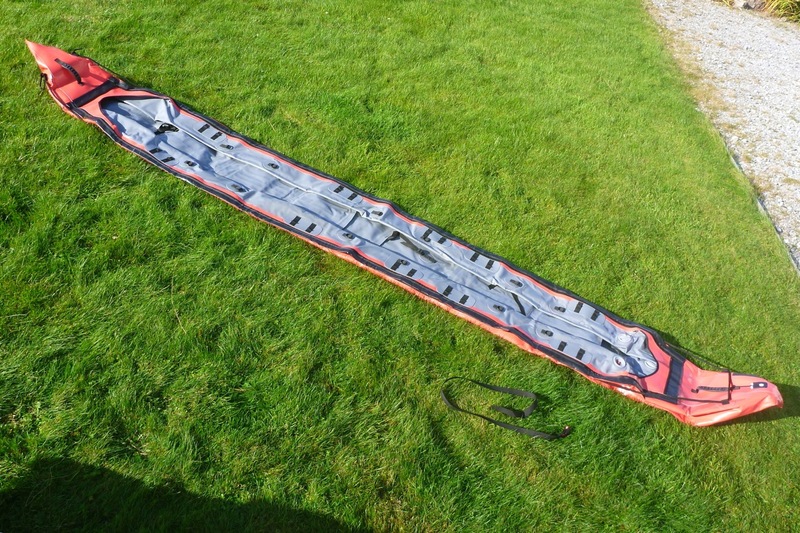 A deck, pump, skirt and other bits added another £200. Coincidentally, it was ten years ago that I bought my very first IK from boatpark, a used and very tippy Safari (right) for about £120. The Seawave’s other dimensions are in the updated table at the top of the page: a tad lighter, shorter and narrower. So even though the Seawave is long and I am heavy, it ought to be fairly responsive when run over-pressure. The 0.75-metre shorter Amigo was stiff as a plank, so the longer Seawave ought to match the Incept’s speeds. And although it’s not as shapely as the Incept, the Seawave’s bow is more of a cheese cutter than the Amigo’s upturned flat floor (left, on the right). 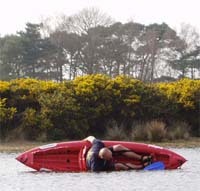 And flipped over the Seawave’s ‘keel tube‘ (below left) is a little more pronounced. I wonder if this could mean better tracking without a skeg? (Yes it does.) 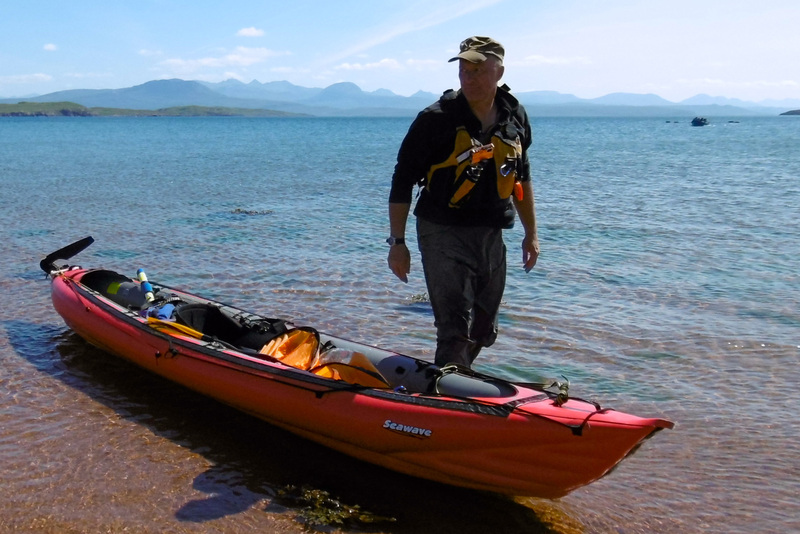 On the shallow Spey one time, the unskegged Amigo was a right pain in the days of backwind we experienced – the back kept coming round requiring a whole lot of hauling effort to keep the boat in line and a lot worse than I recall with the Sunny run without a skeg. A rudder might have fixed that but those upturned bow and sterns are more wind catchers rather than the wave-riding water ploughs they’re supposed to be. Out of the bag, without any hesitation I removed the two inflatable seats and footrests and sold them with the Amigo. 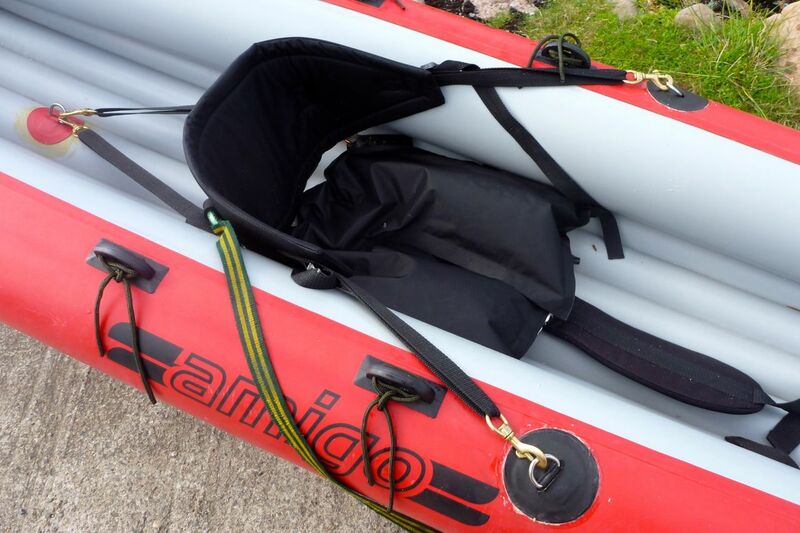 Instead I’ll re-use the very comfy set up I perfected on the Amigo: a packraft seat base (very light) and a foam SoT backrest (left). Luckily the Seawave has loads of attachment points to achieve that. 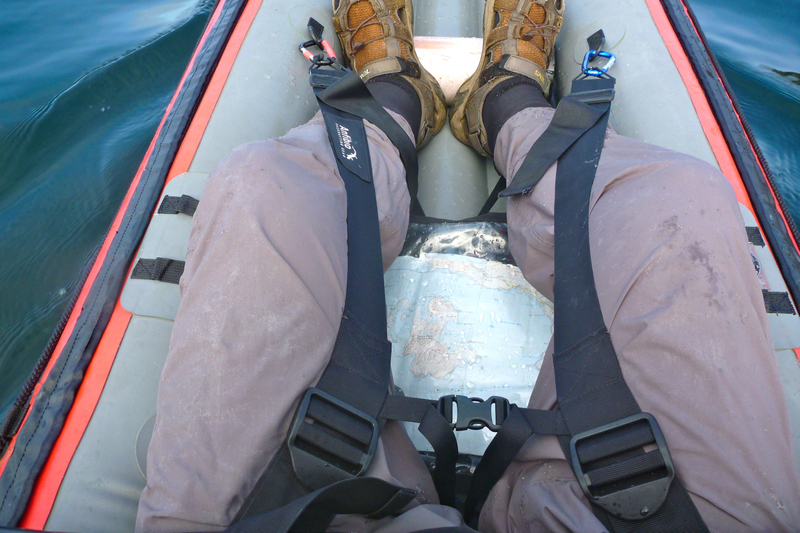 The thigh straps which I’ve become so used to on the Amigo clipped right into some handy D-rings and are a great aid to efficient paddling and connection with the boat. 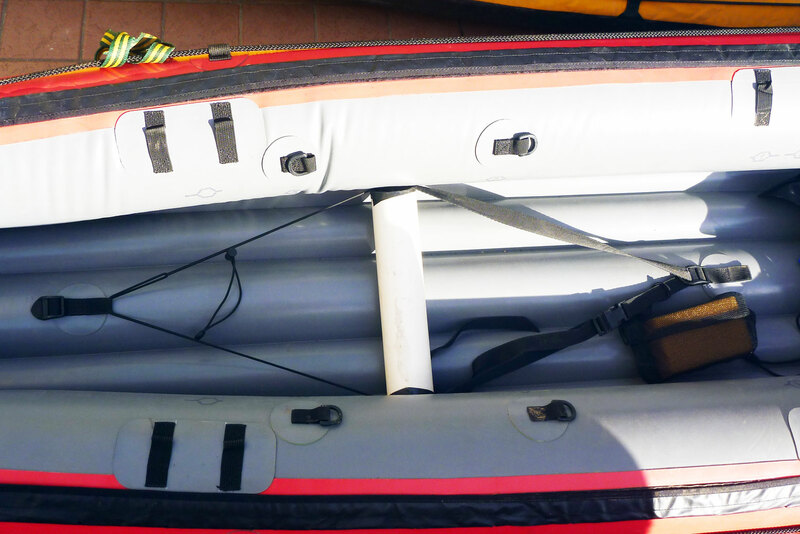 I ditched the heavy SoT straps and instead use lightweight packraft straps. I also added an adjustable footrest tube using a bit of plastic drainpipe and floor attachment points – an idea I got from an old Solar. 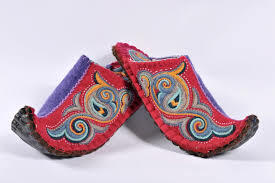 For good drive, in an IK you need solid lower back support and something for the feet to push on. Thigh then straps triangulate the body to make you feel connected to the boat and not perched on a lilo. Talking of the Solar, what they now call regular Nitrilon and on the Seawave is a lot different from that found on our 2006 Solar. That old boat’s fabric resembles the heavy-duty hypalon-like EDPM of the Amigo; a tough material that does feel a little OTT for a humble IK. The Seawave’s supple Nitrilon feels more like a thicker version of Alpacka’s ‘TPU’ fabric: glossy, flexible, a little ‘sticky’ to the touch, probably great to glue cleanly, and easy to fold. I know it was shrinked down in the factory, but look left how flat the Seawave was unrolled out of the box (left). It rolls up very compactly for a 4.5-metre IK, probably the same size as the Amigo. 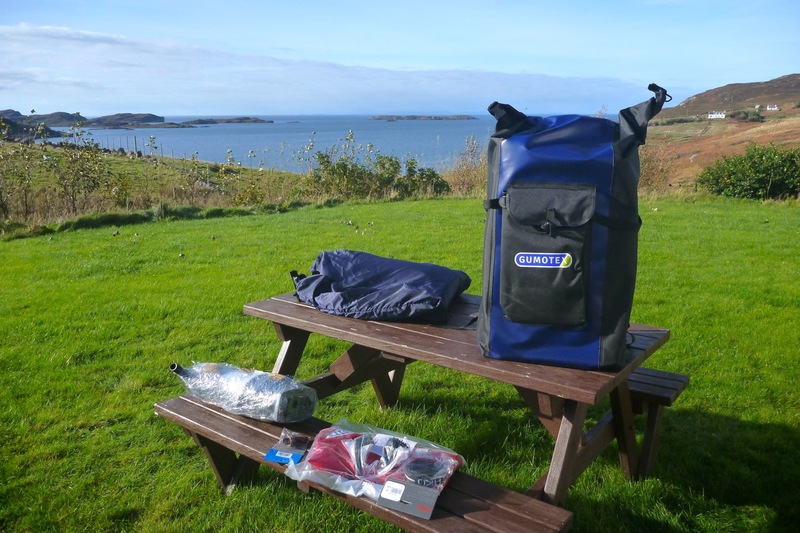 And it all fits in the 100-litre backpack dry bag supplied with room to spare for the deck, alloy struts, footrest tube and even the stirrup pump. 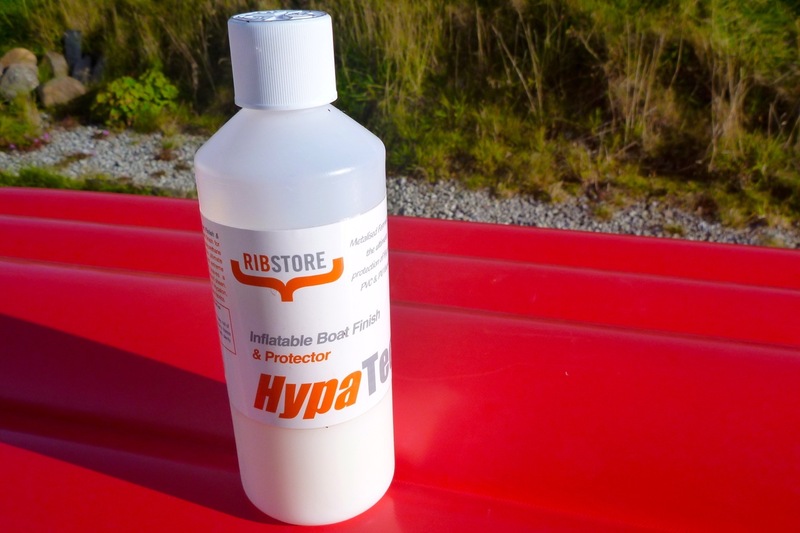 I was shining up the Amigo’s hull with Hypatec (right) prior to selling it. Who knows if it’s any different from Aerospace 303 Protectorant – doesn’t look like it and costs about the same – but it sure makes the Grabner Amigo hard to grab once it’s on. So I lavished some onto the new Seawave, but I can’t say it took to the glossy fabric. Perhaps, like Alpackas, it already has its own embedded coating. Other stuff: valves are a push-push type – no push and twist required and with nice seal caps too. That’s handy when you roll it up and want to get the last bits of air out quickly. The drain spout on the back (right) has already proved handy when out overnight in the rain. The deck lines seems to be a mandatory sea kayak requirement for France. I rarely find them useful, but I suppose it’s about having something to grab when you’ve fallen out. 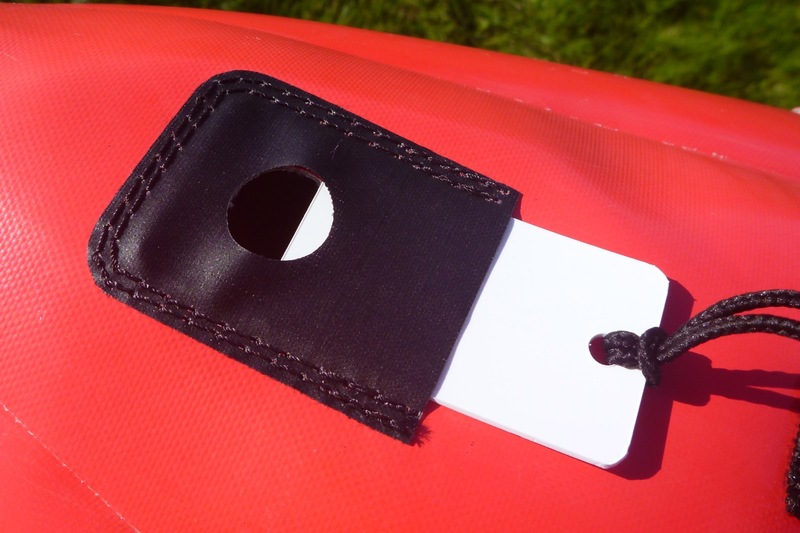 The rubber handles each end are especially comfy compared to the Amigo’s string in a tube. 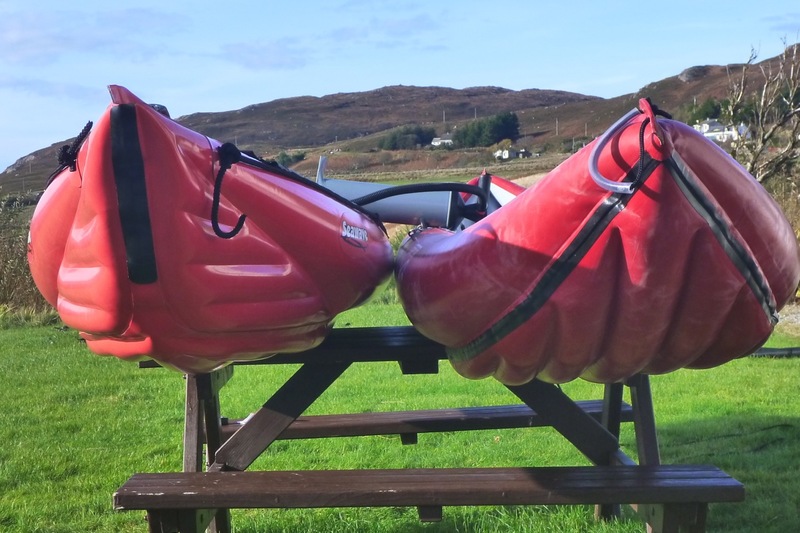 I thought I was going to enjoy using that removable lightweight deck but in the end only used it once when first out in the boat and sold it 18 months later when it was clear I was never going to use it again. 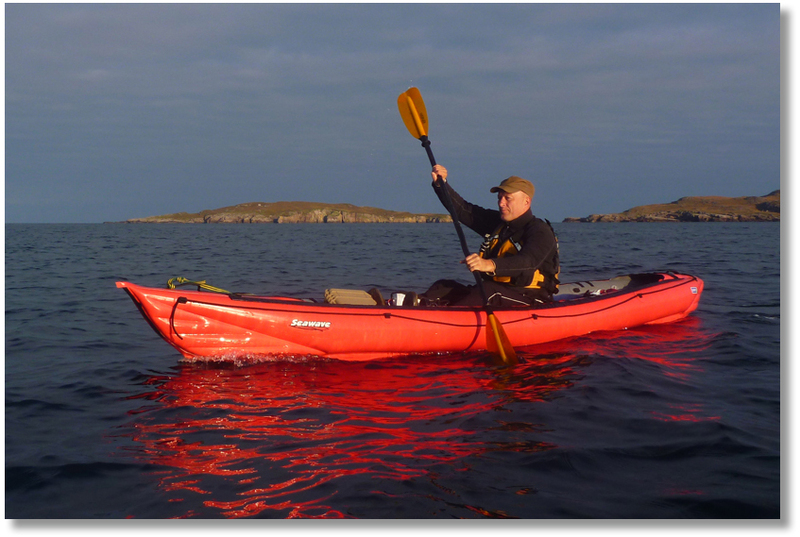 Nice to have the option but the fact is, part of the canoe-like appeal of IKs is running an open boat, and if it’s about keeping dry and warm, I’d sooner wear a drysuit. The truth is, as sea at least, IKs can’t handle conditions where a deck would be needed to stop the boat swamping, and realistically the Seawave is too long for gnarly, white-water river running. Summing up, the whole standard of finish of my Seawave is as good as the Grabner if not better. Not one drop of stray glue or sign of poor alignment. 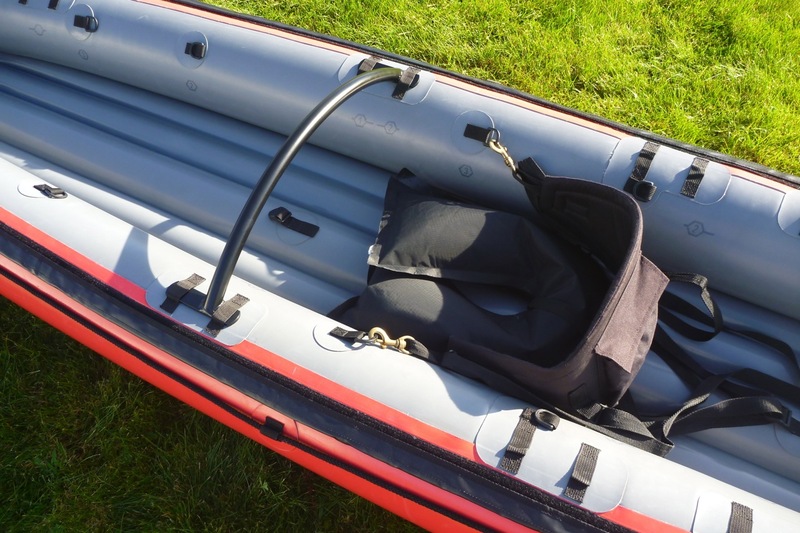 And you get a whole lot more with a Gumotex for less money, like seats and a skeg and numerous attachment points – and even a bag. Even the name Seawave isn’t in the usual goofy Sunny/Amigo happy-clappy vein. 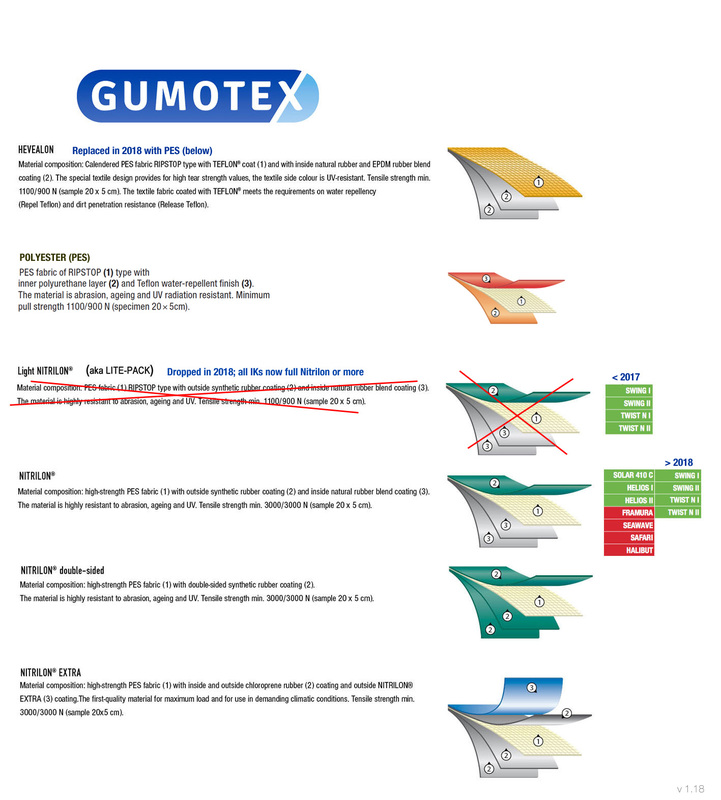 Gumotex have really been on a roll these last few years. Since I bought the boat, I added pressure relief valves to the two side chambers to match the one in the floor and added a strake under the bow and lately, added a rudder. 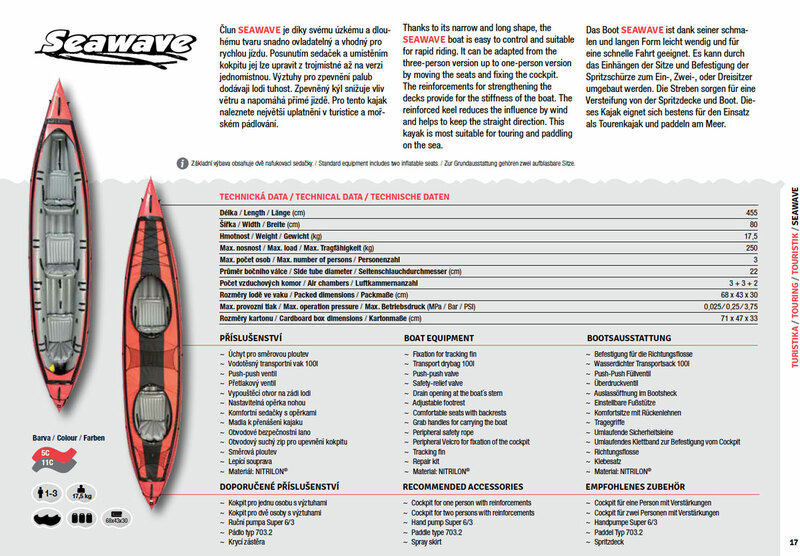 having owned several IKs over the years the Seawave comes the closest to fulfilling my needs: great fabric and quality construction; high hull pressure; well outfitted out of the bag; great price; unembarassing name and plenty of room for touring or tandem paddling.